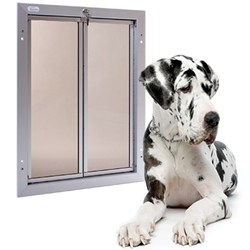 PlexiDor dog doors size large, medium, and extra large are delivered with a steel security plate that screws onto the pet door frame. The plate is a great tool for securing the home, and for signaling to pets that the door is locked. Using the sliding tracks, it takes seconds to mount the plate. 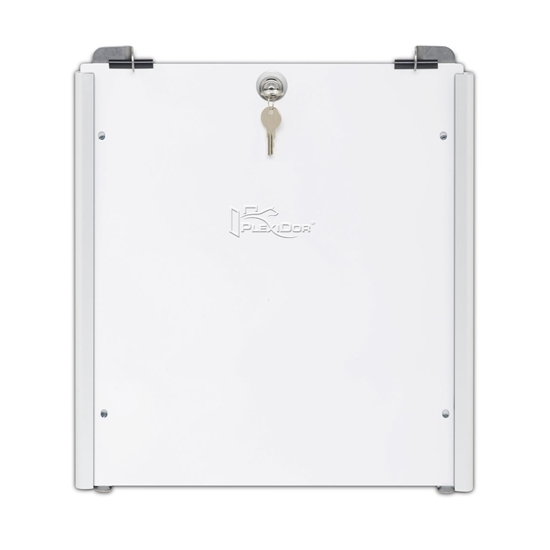 PlexiDor sliding tracks with flip lock makes it easy to attach the security plate. Whether you leave your home for an extended period of time, or want added security every day, the sliding track accessory makes securing your home a breeze. Simply attach the left and right tracks to the interior frame, and slide the steel security plate down the track into place. The tracks attach to the dog door’s interior frame using just a screw driver, and the security plate slides down to its optimal position. Secure the plate with the handy flip lock feature and you’re finished. The tracks are made of strong and durable aluminum, and they’re available in silver or white in sizes medium, large or extra large. Hardware for track installation is included, but not the security plate itself. Plexidor® Pet Door kan installeres i alle typer husdøre; træ, stål, fiberglas, hule materialer mv. Vi bruger ikke stænklapper. Vi bruger høj-effekts akryl paneler. Det samme materiale som bruges til flyruder i mindre fly. Vi bruger ikke maling. Det vil hurtigt skalle af. Vores farvede paneler er lakerede med elektrostatisk pulver og efterfølgende 'bagt' i en ovn, hvilket gør dem tre gange stærkere end traditionel maling. Vi bruger ikke spinkle aluminiums- eller plasticrammer, som en hund let kan tygge eller bøje. Vore rammer er lavet i kraftig aluminium i højeste kvalitet. Plexidor® Pet Door er professionelt udviklet og fremstillet af kvalitetsmaterialer for at kunne levere de allerbedste: lydløse, energi-effektive og sikre døre med lang levetid. Og vigtigst af alt, at de er sikre og nemme at anvende for vores dyr.